Hints of metal and iridescent bluish-black chromatic effects for extremely elegant, refined spaces. The metallic element of Mek Dark slabs allows for pairing with other materials and effects, granting unlimited freedom of composition. Porcelain slabs for kitchen worktops, bar and restaurant counters, hotel lobby and reception areas. Mek Dark endows every space with style and can be used for indoor and outdoor spaces in residential and commercial projects. The porcelain stoneware slabs are available in a matte finish with a thickness of 12 mm. 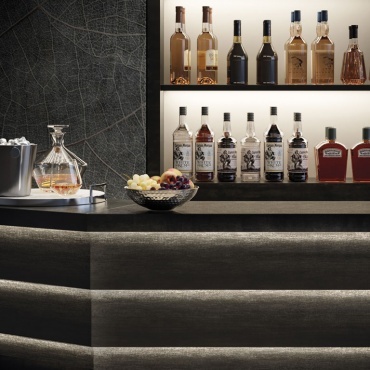 Mek Dark Habitat: Mek Dark matt slabs are paired with Arbor Grey by Atlas Concorde for a bar with a decidedly contemporary mood where the use of objects and other materials contribute to a project with a strong geometric character.